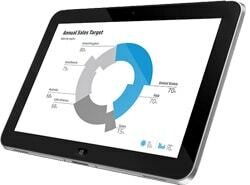 The HP Elitepad 900 is Hewlett Packard’s “premium thin and light Windows 8 tablet” and includes NFC along with an embedded secure element. The device offers a 10.1-inch 1280 by 800 pixel screen along with front and rear cameras, and is available with 32GB or 64GB of storage in variants with and without mobile broadband connectivity. Aimed at business use, HP places emphasis on the tablet’s broad range of built in security features and the fact that it runs Windows 8 Professional. Pricing in the UK ranges from £500 to £700, depending on configuration.